Eco-Congregation Awards are an optional, but important part of the Eco-Congregation Scotland programme. We encourage all eco-congregations to take part in the award process as soon as they feel ready to do so, joining the 140 eco-congregations who have already gained an eco-award in recognition of the care for creation. Under the original award scheme, congregations could apply for a new award every 3 years. Some congregations achieved 1st , 2nd , 3rd and continuing awards, and you can see these on our interactive map. A new set of more challenging award criteria has now been developed, replacing the previous award scheme. All eco-congregations (whether they have previous awards or not) are encouraged to apply for awards at bronze, silver or gold levels. Under the new award system, congregations may apply for an award at any time, and applications can be made at any level – bronze, silver or gold. There is no need to apply for a bronze award first if the congregation already meets the criteria for a silver or gold award. The bronze award is an entry-level award, recognising that a congregation is doing all the basics that we would expect from every eco-congregation across the three broad areas of spiritual living, practical giving and global living. There are 11 criteria, covering these three broad areas and some general aspects (such as planning, and communication), and a congregation must show that it has achieved, or made substantial progress toward achieving, all of these 11 criteria. We would expect most eco-congregations to be able to achieve a bronze award within a year or two of registering. The criteria for the silver award cover the same 11 topics as the bronze award, but set a more demanding standard, requiring (for example) active participation by members, care for creation reflected regularly in worship and involvement in local network events. A silver award should be achievable by any eco-congregation which is taking its responsibility to care for creation seriously. The gold award is the most challenging, and recognises congregations which have developed a long-term commitment to promoting environmental issues as an integral part of their congregational life. We hope this will provide extra stimulus and motivation for our most active congregations. Note that the awards assess the quality and depth, rather than the amount of relevant action being taken, so all 3 levels should be equally accessible to all congregations, whether large or small. If you are considering applying for an award, we recommend that you start with the self-assessment checklist and notes, which will allow you to judge how well you currently meet the criteria for each level. This may show that you are already able to apply directly for a silver or gold award – no need to go for a bronze award first. This document also contains some useful notes that will give you ideas for how you might meet the criteria at your chosen level. You should also read the revised award system August 2018 document, which describes in full the awards, the criteria and the assessment process. To apply for an award, you should complete the appropriate application form (below), and send it with any relevant supporting evidence (by email, if possible) to Eco-congregation Scotland. You may submit information on projects undertaken both prior to and since registering as an Eco-Congregation, but must clearly show that there is ongoing current work at an appropriate level to obtain an award. On receipt of an application form, the application will be reviewed by an Eco-congregation Scotland member of staff. Once satisfied that the application is complete and appropriate, two assessors will be appointed. These assessors will arrange to visit the congregation at a mutually agreeable time to discuss the application. After the visit, the assessors will submit a report to Eco-congregation Scotland indicating whether the award should be made and at what level. The report will also identify particular areas for commendation, and recommendations for ongoing action. 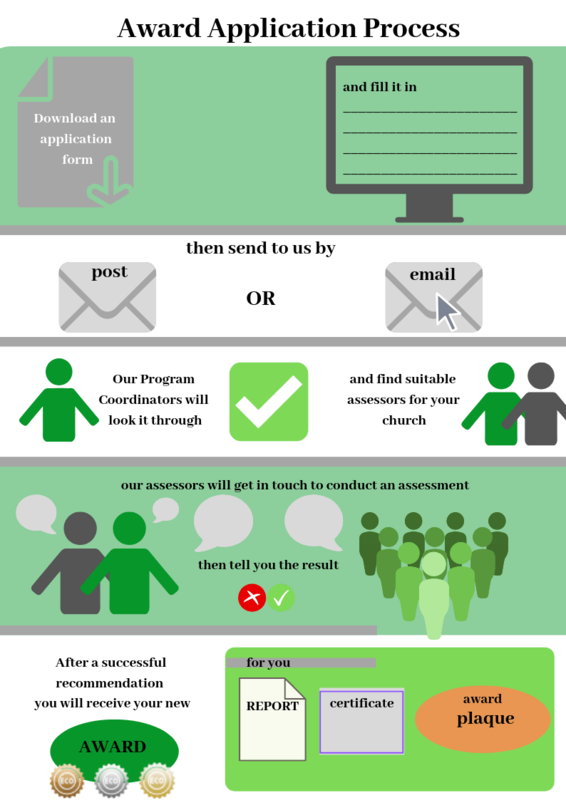 The outcome of the assessment will then be communicated to the congregation. Depending on the evidence presented, assessors may recommend an award at a different level than the one applied for.